Above postcard, sent by Rory Kehoe, showing a pub by a village green, reported as being in Green Street Green. Anyone know the name of this pub. If indeed it was one and not just a tea room. Latest information from Simon Hingley suggests that the pub may be the "Ship" at the junction of the B262 and the B260 just outside of Dartford, the front decoration of the pub itself has changed but the properties next door are similar. 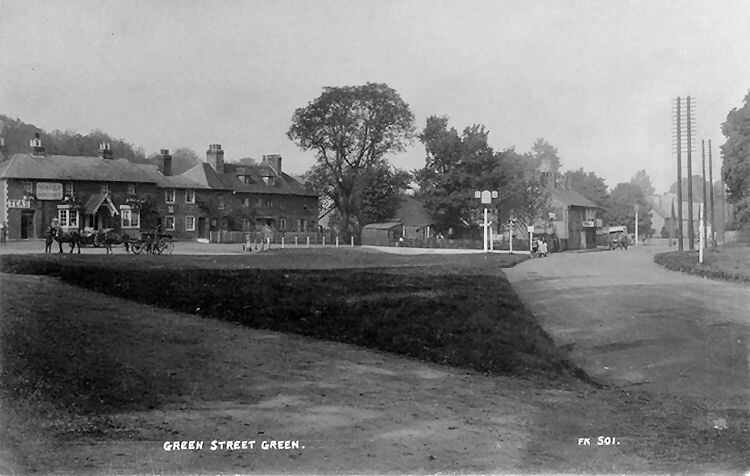 Further research from Debi Birkin says it is the original "Rose and Crown" at Green Street Green and they have the same postcard on the Green Street Green village web site. I am also informed by Roger Smoothy that it is indeed the "Rose and Crown" on the left and the "Royal Oak" on the right.